We’ve all seen them—images of crude oil spills blackening miles of shoreline, coating ducks, soaking otters, lapping the shore with rafts of dead fish. Now imagine a crude oil spill here on the Hudson River—oil coating the shoreline of your favorite park, your community’s waterfront. Our birds, our fish. Are we prepared to see bald eagles coated in oil? 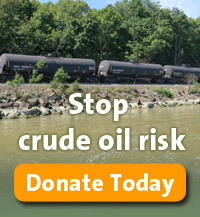 Please make a donation today to help us prevent a crude oil spill on the Hudson River. These are horrible images, I know. As someone who has devoted the last 13 years of my life to the river, patrolling the Hudson for Riverkeeper, I know how hard it is to consider this. The thought makes me sick. But we have to face the facts. This year, up to 5 billion gallons of crude oil will be transported on and along the Hudson River by barge, ship and train. I’ve never seen a threat like this. Some of this oil could be heavy crude with a tar-like consistency. If spilled, oil balls would be suspended throughout the water. A toxic sludge would pool at the river bottom, entering the drinking water intakes that serve nearly 100,000 people, and ruining fish habitat. Much of this oil is the highly explosive Bakken crude that has caused an international frenzy, after a series of oil train derailments led to fireballs, intractable spills, evacuations, and in one tragic case, the death of 47 people in Lac-Megantic, Quebec, where the town’s downtown was totally destroyed. More than 1 million gallons of crude oil were spilled by U.S. rail last year alone—more than in the previous four decades combined. 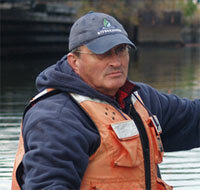 River barges spilled tens of thousands of gallons more. We’ve had our own oil train derailments—four of them. 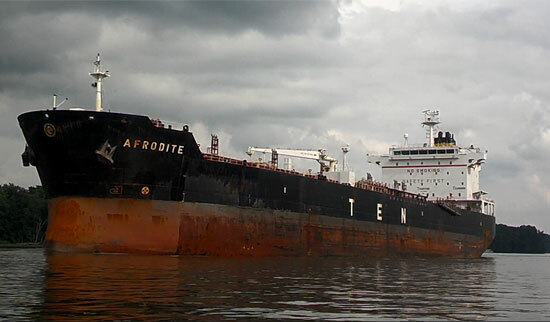 The Hudson’s first crude oil tanker ran aground, threatening an Exxon Valdez-sized spill in critical spawning habitat for shad and herring. We must prevent a spill here. That’s why we launched this new and urgent campaign: to protect decades of work and billions of dollars of investment to restore the river we love. You, too, have a critical role to play. Please make a donation today to launch this critical new campaign. As a non-profit group, we rely on your gifts. It’s not just a nice thing to say: We can’t do it without you. We really can’t. Feature photo by Dana Gulley. The tanker Afrodite, which carries 7 million gallons or more of crude oil, heads north on the Hudson River.